There is no better way to see the USA than by rail. Travel from coast to coast aboard two iconic long-distance trains, Amtrak’s California Zephyr and Lake Shore Limited. Combine these fantastic overnight rail journeys with city stays in three of the USA’s most popular cosmopolitan cities: San Francisco, Chicago, and New York City. Embark on a 10-day cross-country rail vacation that showcases the best of the USA, from unspoiled natural beauty to bustling big cities. Your coast to coast adventure begins in the City by the Bay, San Francisco, for a 2-night stay in this coastal metropolis. 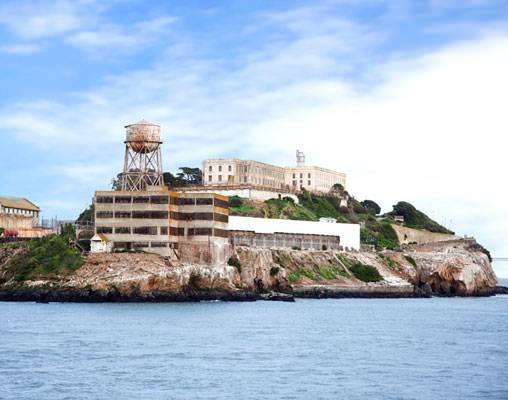 Explore Fisherman's Wharf, visit Chinatown, stand in awe of the Golden Gate Bridge, embark on a hop-on/hop-off trolley tour, or take a bay cruise to get a new perspective of the city and catch glimpses of infamous Alcatraz. Next, board the legendary California Zephyr for the two-night journey across America's western frontier, over the Colorado Rockies, and through the prairies and plains of the Midwest to Chicago. Visit the Art Institute, stroll along the lakefront, shop along the Magnificent Mile, see a play, or enjoy a slice of famous Chicago deep dish pizza. Your journey east continues with the overnight trip from Chicago to New York City aboard the Lake Shore Limited. 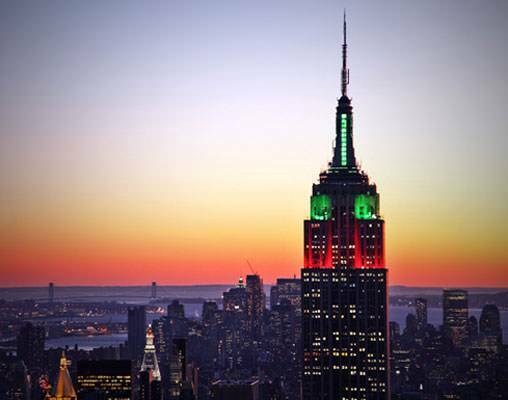 Your coast to coast vacation comes to an end with a 2-night stay in New York City. See all the popular landmarks and attractions on a city sightseeing tour that includes stops at Central Park, Fifth Avenue, the Empire State Building, Greenwich Village and more. This itinerary is available for travel from New York to San Francisco based on your travel preference. Arrive in San Francisco and transfer on your own to your centrally-located hotel with the remainder of the day at leisure. 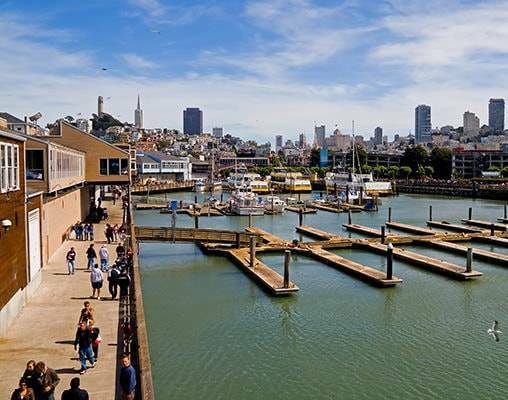 This evening you may wish to dine at nearby Fisherman's Wharf. Overnight San Francisco. 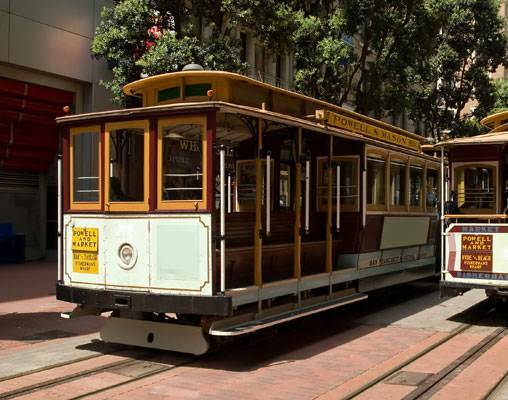 Spend the day exploring San Francisco at your own pace on a guided Hop On/Hop Off trolley tour. See all of the city's impressive landmarks and neighborhoods including Union Square, Golden Gate Park, the Golden Gate Bridge, Chinatown and more! Overnight San Francisco. This morning transfer to the rail station in neighboring Emeryville, board the California Zephyr, and settle in to your onboard accommodations. The train is scheduled to depart at 9:10 am. Your day aboard the train can be spent with a good book, meeting fellow travelers, or enjoying the passing scenery from the glass-walled Sightseer Lounge car. Overnight train. When you awake this morning, the Zephyr will be departing Utah and headed into Colorado. Views of the Rockies will be the backdrop for the better part of today's train journey as you wind your way through tunnels and around mountain curves. Highlights of today's journey include Glenwood and Ruby Canyons and the famous Moffat Tunnel. Overnight train. The California Zephyr travels through the cornfields of Iowa and across the Mississippi River en route to Chicago. You're scheduled to arrive at 2:50 pm. Transfer on your own to your downtown hotel with your evening at leisure. You may wish to visit Navy Pier this evening with a variety of lakeside dining and entertainment options, or perhaps you'll seek out the perfect slice of authentic deep dish pizza. Overnight Chicago. 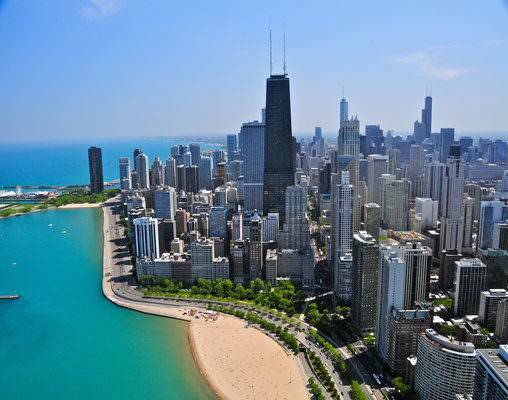 Discover Chicago's most popular attractions on a Hop On/Hop Off tour. 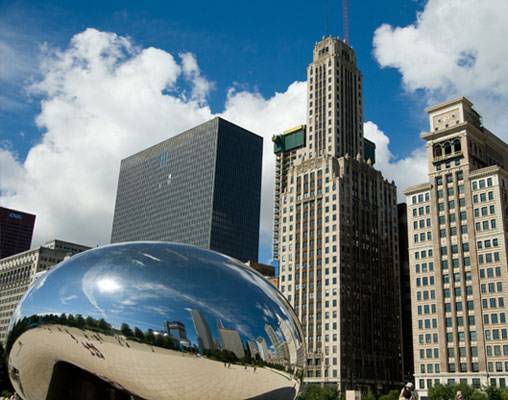 Learn about the city as you travel past notable landmarks like Chicago's Water Tower, Millennium Park, Willis Tower, and more. Overnight Chicago. You have an entire day at leisure to visit one of Chicago's art, science or history museums, continue exploring some of the city's historic neighborhoods, or shop along the Magnificent Mile. This evening transfer on your own to the Amtrak station and board the Lake Shore Limited. The train is scheduled to depart at 9:30 pm. Overnight train. Spend the day relaxing aboard the train, enjoying the passing scenery as the Lake Shore Limited travels its eastbound route. Highlights along your route include a journey alongside the Hudson River, Bannerman's Castle, and West Point Academy. Mid-afternoon you'll pass through the state capital of Albany, arriving in New York City at 6:35 pm. Transfer on your own to your centrally-located hotel with the evening at leisure. Overnight New York City. Spend the day visiting more than 30 of Manhattan's must-see sights on a Hop On/Hop Off double-decker bus tour. 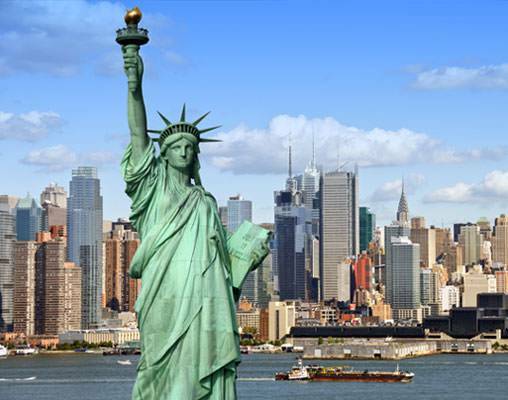 Highlights include Lincoln Center, the Metropolitan Museum of Art, Greenwich Village, Battery Park and more. Overnight New York City. Your coast to coast vacation comes to an end this morning. Consider adding Niagara Falls to your itinerary! Ask about a trip option that takes you from Chicago to Niagara Falls aboard the Lake Shore Limited for a 2-night stay including a comprehensive tour of Niagara and a The Hornblower excursion before continuing to New York City aboard the Maple Leaf Express. Hotels include the Sheraton Fisherman’s Wharf (San Francisco), Palmer House Hilton (Chicago), and Affinia Fifty Hotel (New York City). Amtrak accommodations are available in Coach class, Roomette and Bedroom. Coach accommodations include a reclining seat with leg rest. Roomette accommodations include a private cabin that features two comfortable seats beside a picture window during the day, which converts to an upper and lower berth at night. Bedroom accommodations feature a sofa and chair by day and upper and lower berth by night. Bedroom accommodations also include a sink and self-enclosed toilet and shower. Roomette and Bedroom accommodations include all meals aboard the train. Sleeping car passengers aboard the California Zephyr enjoy meals in the train's Dining car. New contemporary and fresh dining choices replace traditional dining car service on the Lake Shore Limited. Sleeping car passengers may elect to have a chilled prepared meal selection delivered to your Roomette or Bedroom or enjoy meals in a private cafe or lounge car. Click here to view testimonials for Coast to Coast : San Francisco to New York. I’ve wanted to go cross country and I love traveling by rail so it made perfect sense. The trip was beyond my wildest dreams. Our country, all the beautiful people I met on the train. The incredible hard working people on the train who got to know you by name. A fabulous way to see our country and some great cities. Enter your details below if you would like to be notified when 2020 dates and prices are available for Coast to Coast : San Francisco to New York. Hotel and Rail accommodations listed above, are subject to change based on availability at the time of booking. Prices are land-only, per person based on double occupancy. Prices are correct at the time this web page is published; however, are subject to change. Vacations By Rail can provide connecting rail from your nearest Amtrak station.